Relive (or check out) last month's outstanding Mattituck session through fresh eyes, as digital magazine LI Sail reports on the big southerly blow and the twenty or so lucky ones who caught it on the North Fork. Check out Tomas on the cover! The Wolf continued to dominate the media spotlight over weekend, following his dramatic rescue at New Suffolk last week. “I hope the Giants win so this nonstop Wolf coverage calms down,” Jeff Slecta said to me yesterday (the Giants won but the Peconic Puffin isn’t done just yet!). Movie rights are complicated, though. And will he want approval on casting? Tom Selleck plays Scott, of course, but who plays the Wolf? Eastwood is the natural choice but he could be hard to get. (scan of the article thanks to Peconic Jeff). Windsurfers on hand adding spice, color, and general windsurfing excitement? Kevin O'Shea reports the crew included Steve Domjan, Jill Marr, Buddha Mike, Dan, Christina Clement, Joanne, and K-Dog himself. The show airs tonight at 10 Eastern. The Long Island Press (my first employer...I had a paper route with them a zillion years ago) is running a "best of Long Island" survey, and in the Sports category Windsurfing Hamptons is a nominee under "extreme sports". As it's the only windsurfing nominee, I encourage all windsurfers to vote for it, to encourage visibility of windsurfing. As I am a long-time fan of the shop, I encourage everybody to vote for it. As my righteous sailing buddy Jon Ford is the proprietor, I encourage all windsurfers to vote for it. While you're there you can also vote for Long Island's best in skate shops, fishing, surfing, golf, marinas etc. Just remember to remember the Peconic Puffin's half-baked, screwball kook editorial in support of our local shop! Long Island webcams have been on the fritz lately...the Gilgo Cam was off, with a note of "bandwidth exceeded" for explanation, the Cooper Beach cam was stuck with an image from a week ago, and the Meschutt cam on the Great Peconic went into lockdown two weeks ago. B. Shifted its gaze from the Inlet and looked 45 degrees to the right, at our beloved Bowl? Pretty darn great. Good, surely! On a seperate note, we're stoked to find not one but two mentions in the current issue of WindSport magazine. In the article "World Windsurfing Web" editor Pete DeKay writes "It's a big deal to see oneself on the Peconic Puffin, Bill's OBX Beachlife, Maui Surf Report, James' Blog or G-42 to name just a few sites." We can't speak for the other blogs, but for our part we say "we know, we apologize, we didn't mean it, we were just trying to be funny." Later in the magazine in the "getting real" column, a profile of wind Buddha maker Michael Jamieson (who is golden with the Puffin as we bask under the serene gaze of our wind Buddha we get a nod as an early fan of Michael's work. So we're stoked x2. Actually x3, as time spent on WindSport.com found lots of great new video and instructional articles...check out "Phil and Matt's Baja Adventure" for starters. 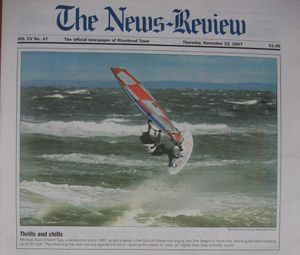 It had nothing to do with windsurfing. But to be in New York City the night of Election Day...to hear the sound of the city when Barack Obama was declared the next President of the United States...it was so overwhelming that I took some photos and wrote a quick post. To my jaw-dropped surprise, The New York Times website included the post in their list of blogs whose coverage they were reading. It made me proud. I imagined historians in the future poring through the Times as they research that night in New York. They'll click on "a sea of exuberance in Union Square". They'll read my humble little piece and nod. Then they'll scroll down a few posts and see me wearing my puffin mask and realize they're in the belly of a goofball beast. The Peconic Puffin likes to be liked. 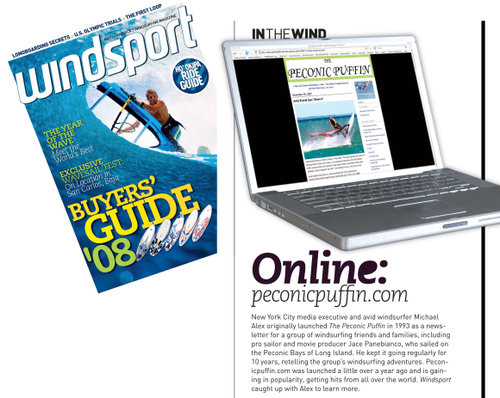 So thank you WindSport magazine for the item on this extraordinarly brilliant windsurfing blog. Go directly to page 30 and skip all the other stuff in their first issue of the year. Actually, don't skip the other stuff. Editor Pete DeKay is starting out 2008 strongly, with (in addition to spotlighting 2008 windsurfing equipment and The Peconic Puffin) looks at real world wave sailing, helmet philosophy, and serves up a lot of great photos for when you're done with the words part. When The Wolf called to say that some guys were heading to the Pier my response was reportedly less than enthusiastic. I distinctly remember saying "okay, see you there!" But hours later as we reflected on the fine session, John said to me "so you like it here now? Because you sounded tentative when I called." "I was intimidated" I confessed. My first Iron Pier session had been some of the most challenging windsurfing I'd ever done. There was the occasional spectacular reach or good jump, but mostly it was survival sailing for me (the Pier vets did well.) So when John called and said "Pier" I may have agreed, but what I wanted to do was whine "doesn't anybody like Sebonac Inlet anymore? Doesn't anybody like Meschutt?" But when I arrived at the Pier, conditions were blessedly a hair lighter than last time, and I was grateful. Sailing with the Wolf, Jon Ford (fresh back from Maui,) John H and Frank, sail sizes on the water were 4.2 (Wolf) to 5.4 (Mr. Ford) with me overpowered on a 5.0 and 77 liters of aircraft. I'd taken a few exploratory runs and was standing on the beach (working up the nerve to go back out and really charge) when about a dozen puffins flew by, only about 50 feet away. Talk about an omen! They were the first puffins I've seen this fall, and I've never had them fly so close! Their message was clear: Time to fly! So now I like the Pier. We are just too popular for our own good. Hamptons.com says we're "ubiquitous" (I hope that's good) while Bunty say's we are good looking. We are waiting for an invite to appear on The McLaughlin Group. I hope they let me wear my mask. Local media seems to have discovered Long Island blogs. Last week's Long Island Press boasted the cover story Citizen Journalists: Long Island Blogs Tackle Topics from Politics to Sports to Rude Behaviour in the Hamptons, and Beyond. 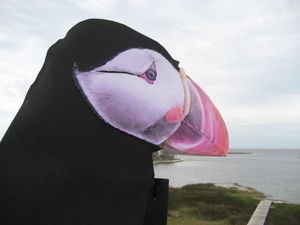 It's not clear whether the Peconic Puffin falls under "sports" or "beyond" but we're in there. We've also just done an interview for Hamptons.com.